Red Sox 7, Orioles 6, 12 inn. After hosting the Devil Rays, the Sox traveled to New York for three games against the hated Yankees. 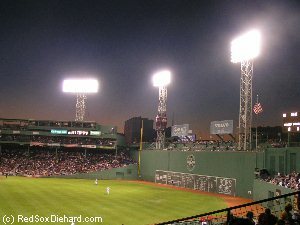 Friday night was a dramatic win, with Bronson Arroyo keeping the Sox in the game despite two long rain delays, and Orlando Cabrera and Johnny Damon knocking in the tying and winning runs against Mariano Rivera in the ninth. A sweep would have left the two teams even in the loss column, but the Yankees won in blowouts on Saturday and Sunday, leaving the Sox 4.5 back with two weeks to play. They returned home to play the pesky Orioles and lost again Monday. On Tuesday, the game was scoreless until the Red Sox finally scraped a run out in the eighth, but Keith Foulke blew the save, allowing a homer in the ninth for the second straight night. It took Mark Bellhorn's walk-off hit in the ninth to deliver the win for the Sox. I was back on Wednesday in my Tenth Man Plan seat behind the bullpen and in a puddle. These seats are annoying because there's a solid inch or two of water under our feet every single game. I can't exactly put my bag with my camera, cell phone, and wallet in it under the seat, so I have to balance that on my lap along with my scorecard. Then anytime anyone else in the row wants to get up I have to balance everything plus stand in the puddle while they walk by. (We kept pointing this out to ushers and Stadium Operations people in the hopes that someone would take five minutes to fill it in and level it off when the Sox had a day off, but no one ever bothered.) Tonight I decided to keep track of how many times I had to get up in the middle of a play, because no one seems to be respectful enought to wait and get up between innings. (The count was four in the first inning, but the worst was the sixth, when we had to get up six times.) The game was televised on ESPN tonight, as evidenced by all the banners they hung around the park. They also announced that SportsCenter anchor Harold Reynolds was trading places with Red Sox employees throughout the night. He had filled in for equipment manager Edward "Pookie" Jackson earlier in the day, and for the first few innings tonight he took the place of the ball girl down the right field line. Meanwhile Pookie and the ball girl would be hosting SportsCenter. That would have been fun to watch, but I wasn't going to be home from the game in time to see it. The Red Sox got on the board first when four straight singles and a sacrifice fly scored two runs in the second. Arroyo was pitching for the Sox, but we noticed before the game that he had taken the cornrows out of his hair. He had first displayed them last week in a great outing in New York. He looked silly but pitched well, but I read in the paper that he said they were itchy and took them out. He gave up a single and two doubles as the Orioles tied it up in the fourth. In the fifth, he gave up a two-run homer to David Newhan. The Sox tied it up in the bottom half on Johnny Damon's single, Manny Ramirez's RBI double, and Trot Nixon's RBI single. But Arroyo was taken out the next inning when he gave up a one-out single on his 99th pitch. (Put those cornrows back in, Bronson!) Mike Myers came in and allowed a double to Larry Bigbie, again giving the Orioles the lead. Scott Williamson pitched a scoreless seventh, and in the bottom of the inning, Manny got on base and David Ortiz launched a two-run homer, giving the Sox a 6-5 lead. Mike Timlin pitched a 1-2-3 eighth, and in the ninth Terry Francona brought in all hs defensive replacements. Pokey Reese was in for Bellhorn, Gabe Kapler replaced Trot, and Doug Mientkiewicz came in for Kevin Millar. Foulke came on for the save, but gave up a homer to pinch hitter Rafael Palmeiro that tied the game. It was the third straight night he had given up a homer in the ninth to the Orioles. Was he starting to wear down? What was going to happen in the playoffs? In the bottom of the ninth, Ortiz reached base and was replaced by pinch runner Dave Roberts. Roberts stole second but was thrown out at the plate a few batters later. Now we were going into extra innings, but Big Papi, who's one of the most likely candidates for ending an extra-inning game on a good note, was out of the lineup. Ramiro Mendoza and Alan Embree got through the tenth. Embree stayed on for the eleventh and set the O's down in order. Mientkiewicz made a nice leaping catch of a line drive by Palmeiro, but landed sitting down on his backside. (Luckily there was no East German judge around to deduct for not sticking the landing!) Eventually the people in the row behind us left and we moved out of the puddle and into their seats, where we could actually see. Curtis Leskanic ran into some trouble in the twelfth, but another nice play got them out of it. With one out and the bases loaded, Jay Gibbons hit a grounder to Mientkiewicz at first. He fired home to force Melvin Mora out at the plate, and second baseman Reese alertly ran over to cover first. Jason Varitek fired to Pokey at first to complete the rare 3-2-4 double play. Orlando Cabrera led off the bottom of the twelfth, one of the few regulars who were still in the lineup. I was surprised to see him in the lineup at all tonight, because he had been in his native Colombia the past two days attending to his wife, who was recovering from an operation. It wasn't certain that he'd be back for tonight's game, but he made sure his wife's relatives were there to look after her, and said, "I have to get back. My team needs me." Did they ever! On a 2-1 count Cabrera swung for the fences and missed, for strike two. But on the very next pitch he connected, and the ball went into the Green Monster seats for the walkoff win. He later said that as his teammates mobbed him at the plate, someone tried to pull his pants down as a joke. What I found even funnier was that there were so many pranksters on the team that he didn't even know which one it was, only that it was likely to have been either Manny or Millar! I was back the next day, in the grandstand in Section 1 this time. This was the final game in the four-game package I had gotten because it included Opening Day. Traffic had been light on the way to the T station, so I arrived pretty early for a weeknight. I walked around the park, knowing I had only one more regular season game left after this one. I browsed the photo exhibit hosted by the Boston Public Library inside Gate A. They had a lot of vintage photos of Fenway, including people hanging onto the billboard across the street to watch a game in the 1930's, and Fenway set up for a college football game in the 50's. 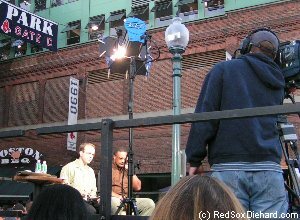 Then I went out to the Gate D end of Yawkey Way, where Tom Caron and Jim Rice were filming the pre-game show. When the Orioles scored a run off Derek Lowe in the first, it was no big deal. The last two nights against Baltimore had been wild games in which the Red Sox had to come from behind and win it their last at-bat. Lowe also picked off one baserunner and induced a double play, so the damage wasn't as bad as it could have been. The Sox tied it up in the second, when Jason Varitek walked, stole second, and scored on Doug Mientkiewicz's hit. Lowe coughed up the lead again in the fifth, when Miguel Tejada took him deep for a three-run homer. But again, the Red Sox tied it back up in their half of the inning, on a bases-loaded walk by David Ortiz and a two-run single by Kevin Millar. Terry Adams pitched the next two innings without incident, and it wasn't until Ramiro Mendoza entered in the eighth that things got out of control again. Two hits and a wild pitch put runners on second and third with one out. Mike Myers came in, and one runner was thrown out at the plate on a fielder's choice. But after Myers intentionally walked the next batter, pinch hitter Jose Leon ripped a two-run single. The Red Sox would have to catch up again. In the top of the ninth, with the Sox only trailing by two and having shown the ability to come back all night, Terry Francona inexplicably brought Byung-Hyun Kim in to pitch. B.K. had struggled badly at the beginning of the year and spent the past few months on the disabled list and in Pawtucket. If the Red Sox wanted to see what he had, this wasn't really the place to do it. It needed to be more of a blowout one way or the other. Granted most of the dependable relievers had appeared in the extra-inning game the night before, but Timlin had only gone one inning. It seemed that Francona was looking ahead to the weekend matchup with the Yankees at the expense of tonight's game. If they lost tonight and fell 4.5 back, the weekend series wouldn't matter anyways. I didn't want to settle for the Wild Card, I wanted to take the division. It was still possible, but they needed the win tonight. Predictably, B.K. gave up two runs, leaving the Sox down by four with only the bottom of the ninth remaining. Kevin Youkilis pinch hit for Mientkiewicz and struck out. Bill Mueller singled, and Ellis Burks was called in to pinch hit. Burks was at the end of a long and productive career that had begun with the Red Sox in 1987. After stints with the White Sox, Rockies, Giants, and Indians, he signed with the Red Sox for one final season. He had been plagued by knee injuries throughout his career, and this year was no exception. He had been activated from the D.L. to have one last chance to bat. We gave a long standing ovation for his entire at bat, and he singled on a full count. He came out (to another ovation, after which we stayed standing for the rest of the inning) for pinch runner Ricky Gutierrez. Dave Roberts struck out, but Orlando Cabrera singled to load the bases with two outs. Manny Ramirez was next, and we needed some late-inning heroics. He didn't hit a grand slam, but he did have a two-run single. If only B.K. hadn't given up those last two runs, they'd be tied right now. Instead, it was 9-7, with two on, two out, and Big Papi at the plate with the chance to send us all home happy. On the first pitch he launched a drive deep to right field... where it was unceremoniously caught on the warning track to end the game. I was really frustrated about the way the game had been managed. They had really needed this win, and it seemed they should have been able to do it. I was glad I didn't have a ticket to Friday's game against the Yankees. The Sox were ahead 4-3 after seven innings, and all the good relievers were rested because they had been held out of Thursday's game. But Terry Francona inexpicably sent Pedro Martinez out for the eighth inning, and just like last October, he gave up the lead. Had we learned nothing? That's what Timlin and Embree and now Foulke are for! Two inexcusable losses in a row had made winning the division nearly impossible. Saturday it took a seven-run eighth inning against the Yankees' bullpen to break a 5-5 tie for a 12-5 win. 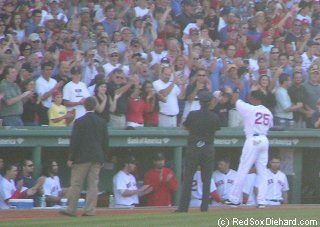 On Sunday I arrived before the gates opened, and stood behind the Red Sox dugout to watch batting practice. Peter Gammons from ESPN was there. So were Dan Shaughnessy, Jackie MacMullen, and Bob Hohler from the Boston Globe. Larry Lucchino walked by with his wife. Mike Myers and Bill Mueller signed a couple of autographs. So did Dave McCarty, except that two kids standing next to me kept calling him Walter. I told them his name was Dave, and that Walter McCarty played for the Celtics, but they kept calling, "Walter, Walter!" Finally McCarty himself told them, "Walter is a basketball player", and needless to say he stopped autographing before he got to them, which meant he didn't make it over to sign for me either. I just hoped he didn't think they were with me! When batting practice was over, I headed around to Autograph Alley inside Gate A, where I got 1980's catcher Rich Gedman's autograph. From there, I headed over to my seat. Today was the last home game of the season, as they would finish with a week on the road. I was back in my Tenth Man Plan seat in the puddle, but this was the reason I had chosen this plan. I like to go to the final home game each year, and figured since they were facing the Yankees it would be a tricky ticket to get without being included in a package. The other reason I wanted the Tenth Man Plan was because it came with a ticket to one Divison Series game should the Red Sox make the playoffs. I had already gotten my ticket, even though they hadn't clinched anything yet. It was for "ALDS Home Game 2", which meant if they somehow won the division it would be Game 2, but if they were the Wild Card, they'd open on the road, and Game 4 would be the second home game. Then if either team swept, there's be no Game 4, so I wasn't at all sure whether I'd even have another game at Fenway this year. Before the game I went over to check out the section where we would be seated if we did get to go to a playoff game. It was much better than my "puddle seat", in the grandstand of Section 4. Curt Schilling matched up against Kevin Brown this afternoon. Brown had broken his non-pitching hand last month when he punched a wall after a Yankees loss. He had said he'd be ready in time for the playoffs, but today was his first game back. The Red Sox didn't take long to get to him. Johnny Damon grounded out to start the first inning, but then Mark Bellhorn singled. Manny Ramirez, David Ortiz, and Trot Nixon followed with three straight doubles, knocking in three runs. Jason Varitek followed with a single for the fourth run of the inning, and after Orlando Cabrera had struck out for the second out, Bill Mueller's single knocked Brown from the game. That was all we needed in the stands to make this an enjoyable day, but the fun didn't stop there. Derek Jeter's error helped the Sox score three more runs in the second. I thought it was funny that the outfield fans were serenading Gary Sheffield with chants of "You use steroids." Earlier in the season we had chanted "Bal-co, Bal-co" every time he was up, in a reference to the Bay Area Laboratory Co-Operative, from which he had received steroids, according to his testimony to a grand jury. But now, apparently, we were done hinting around, and just spelling it right out for him. Meanwhile, after three innings, Schilling hadn't allowed a single baserunner. He walked Alex Rodriguez in the fourth (so much for the perfect game) then walked Gary Sheffield and Hideki Matsui. The bases were loaded on twelve straight pitches out of the strike zone, but he still hadn't given up a hit. He came back to strike out Bernie Williams, but before he got out of the inning Jorge Posada had a hit up the middle to score two. The score was still 7-2 Sox, so I was more upset that the hit had broken up a no-hitter attempt than the fact that it scored two runs. Bill Mueller hit a solo homer off Esteban Loaiza in the fifth, and the Sox got three more off Loaiza in the sixth for an 11-2 lead. One-by-one, all the starters came out of the game, and Gabe Kapler, Pokey Reese, Dave Roberts, Dave McCarty, Adam Hyzdu, Doug Mirabelli, Ricky Gutierrez, and Kevin Youkilis got to play. Between innings, they played a nice tribute to Ellis Burks on the scoreboard, and he came out of the dugout for another appreciative ovation. We were appalled that he didn't get into the game when all the other bench guys were, and started chanting, "We want Ellis." I found out later, though, that he had had his knee scoped again after his pinch hit the other night, and was unavailable to play. Curt was done after the seventh. He had walked John Olerud in the seventh, but that was the only baserunner other than those in the fourth. Posada had been the only Yankee to get a hit off him. Pedro Astacio came on to pitch the ninth, and he threw ball 2 behind Kenny Lofton. Astacio was ejected and warnings were issued. Terry Adams came in and gave up a two-run homer to Andy Phillips before getting out of the inning. In the bottom half, Brad Halsey threw the first pitch too far inside to Dave Roberts, and Halsey and Joe Torre were immediately ejected. Both benches emptied, but there was no fighting. They simply stood there a few minutes, then headed back where they had come from. The attendance today was 34,582. It was the 145th straight sellout, which is the third longest sellout streak in baseball history. The final attendance for the season was 2,837,304, marking a new franchise record and the fifth straight year that record has been broken. 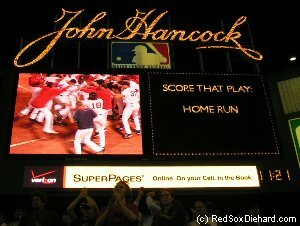 They finished the 2004 season with a 55-26 record at Fenway Park, the second best home record in the majors. When the game was over, we headed around to the players' parking lot to give the team a proper sendoff. Several hundred fans packed the corner of Yawkey Way and Van Ness, and lined the sidewalks of both streets. We saw 1980's pitcher Oil Can Boyd near the entrance of the lot. He signed autographs for a couple of minutes, but I couldn't get close enough. We staked out a spot across the street, and cheered each player as he drove out.